A cluster is a group of computers linked together in a network that share disk resources in a high-availability environment. The machines in a cluster cooperate to provide a set of services or resources to clients. In a cluster configuration, if the platform supporting a set of applications fails, the functions of the applications are transferred to a backup platform. This backup (or standby) platform is ready to immediately provide support for the critical application processes normally assured by the principal platform. In most cluster solutions, when the original platform recovers from failure, it recovers application processes from the secondary system that has temporarily acted as the active system. 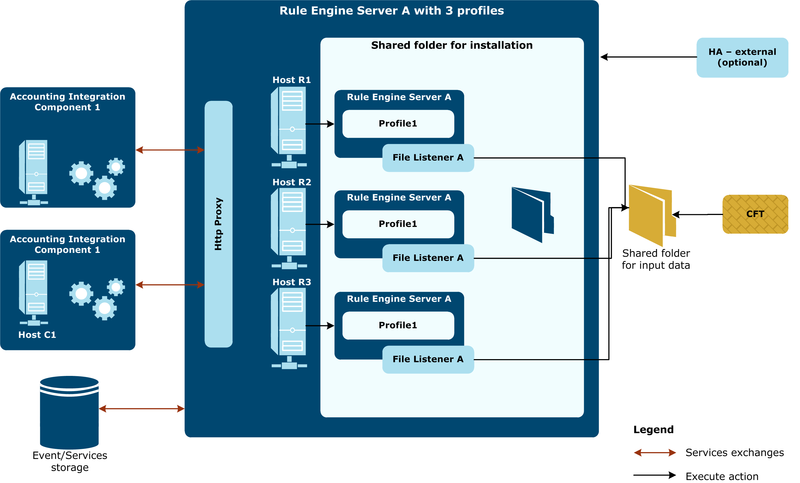 Rule Engine Server can be installed as cluster to benefit of high availability, parallel processing and failover. All the machines that will become nodes must have an OS of the same family installed (For example, Unix/Linux, Windows). A shared folder solution should be configured and be accessible for all the machines. The shared directory and the installation directory paths that will be used for the installation of the first node must exist and be available on the rest of the machines. The following graphic represents a sample cluster architecture with three Rule Engine Servers and three profiles. This is a cluster installation with three nodes. The component name of theRule Engine Server is RuleServer A and includes three profiles: Profile1, Profile2 and Profile3. Two shared folders are used: Work Folder and Shared folder for input data. The Work Folder is a shared folder, accessible to all the nodes, because if Profile1 finishes processing and it goes offline, Profile2 and Profile3 must be able to return the results that were processed by Profile1. The Shared folder for input data is a shared folder because if we put some input files in it, all the nodes must be able to process those input files. To put the input files in the Shared folder for input data, from there, the Event Processor distributes the process operation jobs to the running profiles. If a node fails during processing, another node re-executes the job. When the processing is finished, the results are stored in the Work Folder, the input and output audit trace results can be sent to Datastore Client to be injected into AccountingIntegrator, the rejects can be sent to InterPlay, and so on. To process REST calls through the Http Proxy. If one node fails during the processing, the result of the REST call emphasizes that. In this case, if the REST call is performed again, the job is executed by a node that is online. The results are stored in the Work Folder and will be exposed in the REST call response at URLs which can be passed to other services. Rule Engine Server – Rule Engine Server Profile (a unique string that identifies the node. For example, profile1). Rule Engine Server – Rule Engine Server Profile (a unique string that identifies the node. For example, profile2). Repeat the steps for each node. See Setup a load balancer for cluster installation for post-installation information regarding cluster installation for the Rule Engine Server.